North West is already giving her supermodel aunt Kendall Jenner a run for her money! Kim Kardashian's oldest daughter made her runway debut at the L.O.L. Surprise Fashion Show in Palisades Park, California, this weekend — and she totally slayed it. The 5-year-old, who was one of several pint-sized models at the popular toy line's fashion show, helped celebrate the brand's new product, L.O.L. Surprise Bigger Surprise. North walked down the runway dressed as L.O.L. Surprise doll Thrilla, and totally nailed her Michael Jackson-inspired look. All decked out in a matching red skirt and jacket and a black zipper crop top, North brought major attitude to the runway. The mini fashionista accessorized with a high bun, glitzy shades and a fashion-forward black purse for her moment in the spotlight. We still can't get over North's sassy little spin when she's turning around at the end of the runway! North joined Busy Philipps' daughter, Birdie, and Sara Foster's daughter, Valentina, at the girl power-filled event, according to Harper's Bazaar. Naturally, Kim was also on hand to cheer on her daughter, and the proud mom seemed thrilled to watch North strut her stuff down the runway. "North is completely obsessed with L.O.L. Surprise already, so when we found out there was going to be an L.O.L. Surprise BIGGER Surprise Fashion show, she absolutely had to be involved. She loves to dress up like her favorite characters, so it was so exciting for her to actually become a real-life L.O.L. doll," Kardashian said in a statement. North nailed her runway debut, but this is hardly her first fashion gig. Earlier this year, she looked totally adorable when she joined mom Kim and grandmother Kris Jenner to pose for a Fendi campaign. 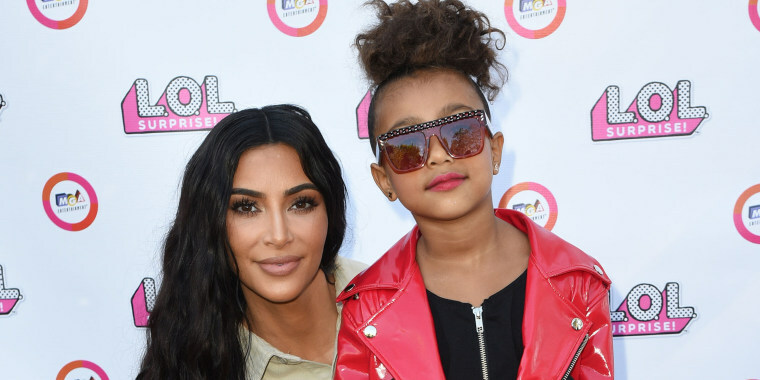 Last year, North also modeled a jacket from her parents' kids clothing line, The Kids Supply, and looked like a total boss. And who can forget North's fashion debut — at the tender age of 13 months old — as a model for CR Fashion Book? For a 5-year-old, she's sure got quite the portfolio so far!